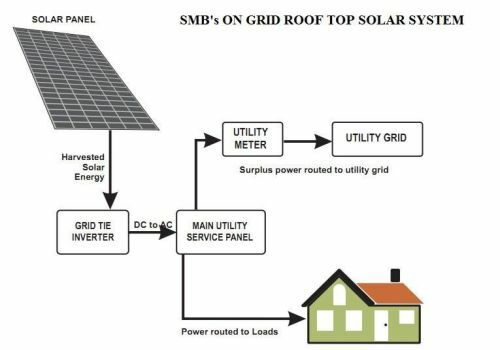 By installing On Grid Roof Top Solar Power Systems, the customer saves up to 95% in his electricity bills. The payback period on any installation does not exceed 5 years. The system is maintenance free with a life of 25 years for SPV panels. 1. Residential Bungalows and Row Houses. 2. Factories, Educational Institution and Commercial Infrastructures. 3. Religious Buildings, NGO’s and Trusts. 4. Housing Societies, Hospitals, Petrol Pumps and Restaurants. 1. Monthly bill can be reduced to almost zero. 2. Pay-back period is not over 5 years and in case of tax benefits, it’s even much lower. 3. System has no maintenance except regular cleaning. 4. Larger goal of environmental conservation is achieved. Your installation will be a humble contribution towards National and International Drive to counter climate change.